Providing vital armoured artillery support to for your Soviet forces to bombard enemy entrenched units with a hail of devastating missiles is the BM-21 Hail Rocket Launcher. As the name suggests, the artillery tanks launchers a hail of missiles to rain down upon the enemy, the number of rockets that each vehicle is able to quickly bring to bear on an enemy target makes it effective, especially at shorter ranges. One battalion of eighteen launchers is able to deliver 720 rockets in a single volley. Perfect to add to your collection and use within this awesome World War III game. 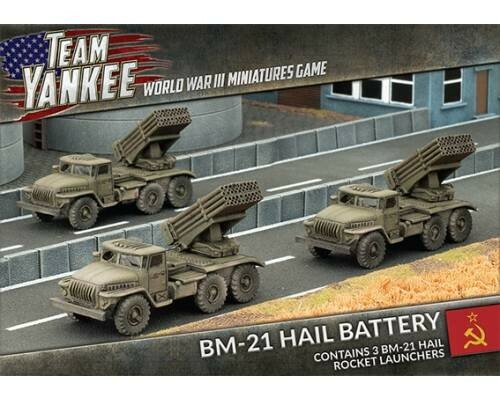 Includes three resin and metal BM-21 Hail Rocket Launcher trucks and one Unit Card.